Read all about it in the Star, Sun, Mirror etc. Louis Charalambous represented Robert Murat in his libel action against eleven tabloid newspapers. Two other claimants in the same case, Sergey Malinka and Michaela Walczuch, were awarded apologies and a “substantial six-figure settlement”. “There was a pack-dog mentality here and my clients and their families were the prey. The children of Robert and Michaela, little girls, one not much older than Madeleine, were hounded and had to go in and out of their homes with coats over their heads. Tea with lawyers? Take care. Bring a tape recorder and a copy of the invitation. Leave wallet at home. But what about the story, the single-thread story? What about our Maddy? Case closed. What what about Murat? Maybe Murat wasn’t after the money, just closure? Maybe the papers got of lightly? So says a professional PR not in the least bit bitter about being dropped by Murat. EXCERPTS from Kate McCann’s diary covering the first agonising weeks after daughter Maddie vanished have emerged. They show that the desperate mum left messages asking PM Gordon Brown to “increase political pressure” to aid the search. After he phoned 40-year-old Kate and husband Gerry, she noted that Mr Brown was “nice and supportive” — but that she “felt a bit emotional after”. 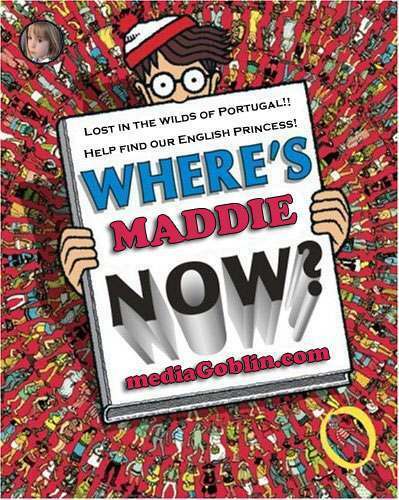 Portuguese police knocked on just 443 doors in the failed hunt for missing Madeleine McCann. In stark contrast, British police probing the disappearance of Shannon Matthews earlier this year knocked on 5,000 doors and searched 2,000 houses. Nine-year-old Shannon was found in 24 days, whereas Portuguese police have stopped looking for Madeleine after 14 months. But the police door knocking wasn’t what found Shannon Matthews. The rozzers responded to a tip off from a neighbour of one Paul Donovan. Also, Shannon Matthews’ mother, Karen Matthews, is under arrest for her alleged part in her daughters’ disappearance. Kate McCann is innocent. So what do the two matters have in common? Or is this Tabloid Bingo?